Back in the days before fridges, butter would be kept cool in the shade of the larder. 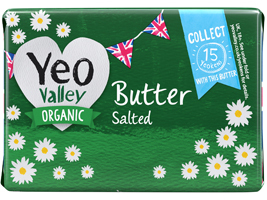 Nowadays, not many of us have a larder, so if you want real butter that’s not too hard and not too soft but still tastes great, then give this a go: our organic butter with a bit of organic sunflower oil stirred in. Organic unsalted butter (milk) (62.5%), organic sunflower oil (31%), water, salt. Excellent and an English cheaper compromise to Lupak.